I like to do my meal planning at the beginning of the week. I mostly plan my meals around our schedule, meaning what we have going on each day and how much prep time each meal will take. Slow cooker or crock-pot meals are great for days that I have plans late in the afternoon. It makes it so there is one less thing to worry about and helps my days to go smoother. This is one of those meals that only takes a minute to prepare in the morning and by dinner time it is perfectly cooked. Directions: Add pork and beef broth to crockpot, and cook on low for 4-6 hours. Separate the pork from the liquid and shred. Add BBQ sauce to taste. Add 2oz of pulled pork to rolls. Pork tenderloin is my cut of choice for this meal because it is super lean. It may be surprising, but pork tenderloin has the same amount of fat per serving as boneless skinless chicken breast. 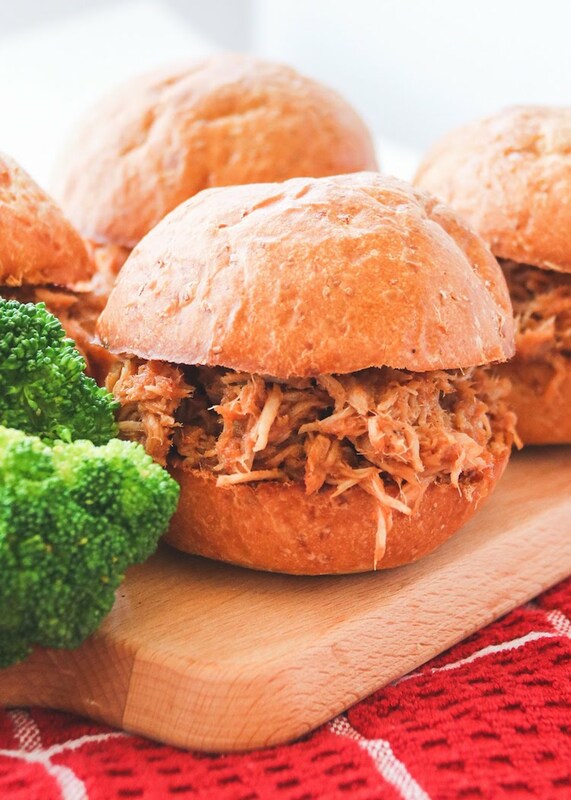 When you cook it on low in the slow cooker it keeps it juicy and tender and provides you with that pork flavor you love without all of the fat. Protein is a key part of every diet—especially when you are pregnant! All you have to do is add one 1lb of pork tenderloin and 1 can of beef broth to your crock pot and cook it on low for 4-6 hours. If you have a bigger family or want more for leftovers just add one additional can of broth for each additional pound of pork tenderloin. After 4-6 hours simply shred the pork and add BBQ sauce to your liking. Then fill a ciabatta roll, or your preferred hoagie bun, with a few ounces of pork and pair your sandwich with some roasted veggies and you have yourself a meal.